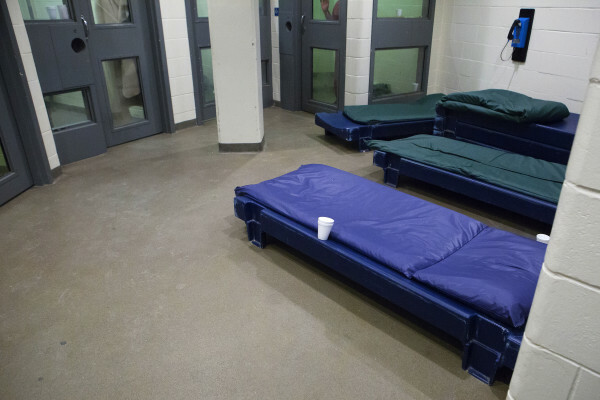 Inmates wait in holding at the Penobscot County Jail in Bangor on Feb. 12, 2015. 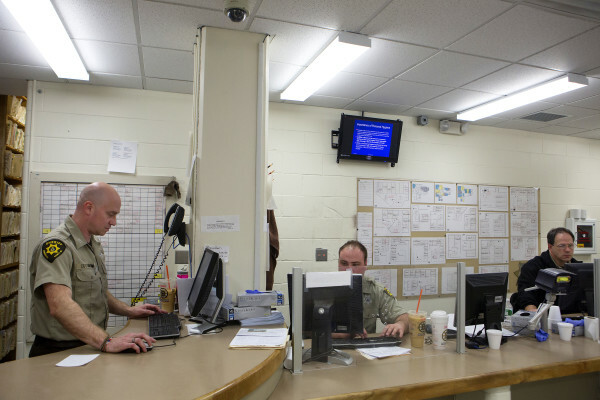 Officers work to book inmates at intake at the Penobscot County Jail in Bangor on Feb. 12, 2015. 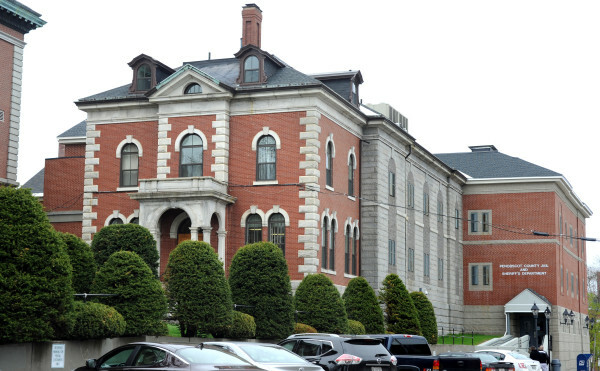 AUGUSTA, Maine — In an effort to help eliminate overcrowding in the county jails, a task force has recommended changes to the state’s bail laws and a study that could lead to the elimination of bail in most cases. In a report issued last week, the committee also recommended changes to the way the court system handles unpaid fines. The changes are aimed at decreasing the number of pretrial detainees, particularly those arrested on probation or bail violation charges and for failing to pay court fines because they don’t have the money. The Pretrial Justice Reform Task Force on Friday issued its 34-page report with recommendations and more than 140 pages of supporting documents. The committee was formed in May by Leigh I. Saufley, chief justice of the Maine Supreme Judicial Court. The task force included judges, court employees, elected officials, prosecutors, defense attorneys, jail officials, law enforcement officers and advocacy groups that represent victims. A study of five jails was conducted in April to determine why the 1,556 pretrial inmates were incarcerated. The study found that inmates were booked for the following reasons: 65 percent for new criminal offenses; 23 percent for unpaid fines; 15 percent for probation revocations; 11 percent for failing to appear for a court date; 6 percent on motions to revoke bail; 4 percent for failing to appear to address unpaid restitution; and 5 percent for other reasons. Some inmates were booked on more than one offense, so the total exceeds 100 percent. The jails included in the study were: Androscoggin County Jail, Aroostook County Jail, Kennebec County Jail, Penobscot County Jail and Two Bridges Regional Jail. Facilities in Androscoggin, Kennebec and Penobscot county often must board out inmates at other jails because of overcrowding, the report said. The recommended changes concerning fines include raising the fine amount owed before a warrant for unpaid fines is issued from $25 to $100; allowing judges to waive minimum mandatory fines when defendants are unable to pay them; and expanding public service programs to allow people unable to pay fines to perform volunteer work instead. Recommended changes to bail-setting practices include: the creation of a statewide fund to pay bail commissioners, who currently operate independently and collect a $60 fee from each person released on bail; the elimination of bans on use and/or possession of illegal drugs from bail conditions unless the use of either contributed to the alleged crime; and the expansion of pretrial monitoring programs to help prevent bail violations. The cost of implementation of all the recommendations was estimated at more than $1.6 million annually. The major cost would come from making bail commissioners state employees, the report said. — The pretrial risk assessment tool being used by Maine Pretrial Services for possible use statewide. — Implementation of a pilot project that uses pretrial risk assessment in setting bail. — The bail systems in jurisdictions that have completely or almost completely eliminated cash bail. — Prison diversion programs with the goal of establishing a program in Maine. Among the recommendations rejected by the task force was one that called for an additional $789,000 a year so the Department of Corrections could hire more officers to supervise probationers charged with violations of probation.